LOVE YOUR OWL... LOVE IT!!! 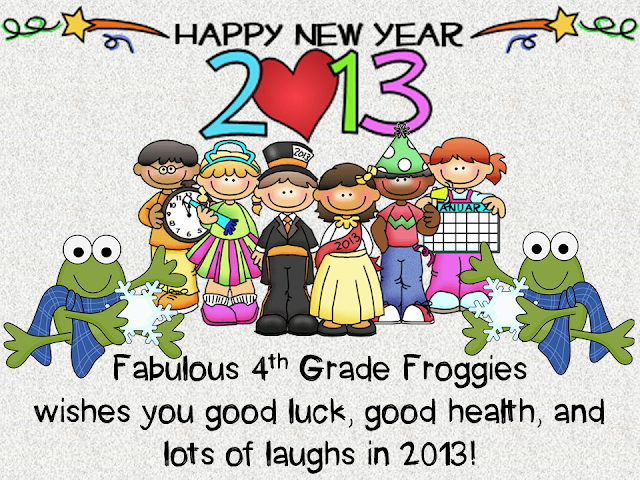 and you can do it you can do it... love ya froggylicious!!! thanks for joining!!! Mmm, peanut butter m&m's sound good right now!! I learned the hard way what happens if you don't take care of yourself first!! I am glad you are putting that on the top of your list! Hoope this year is a fabulous one!! Yum...peanut butter M&M's. I haven't had them in forever. My mouth is watering just thinking about them! I had to pop back in one more time. 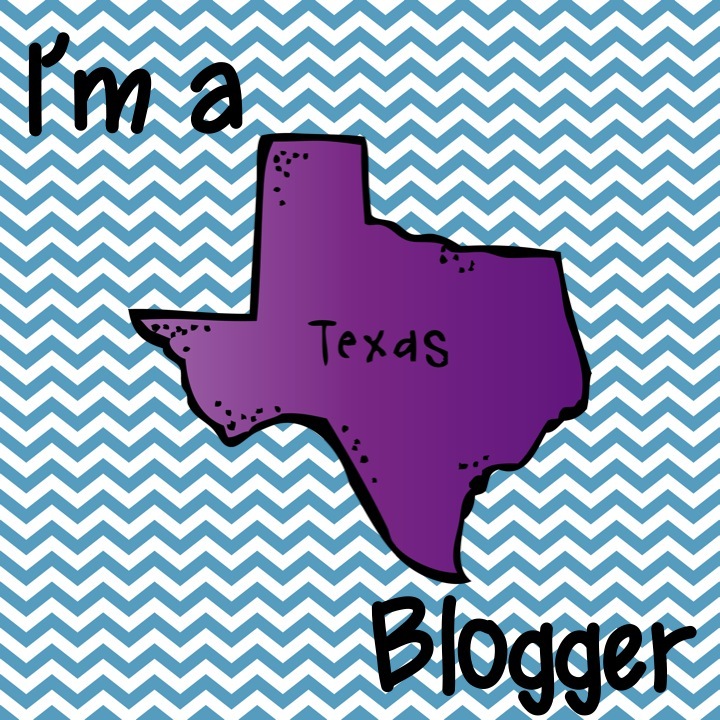 I saw your comment on Color Me Kinder's blog about your husband being a Sheriff's Deputy! My husband is one too and works in the jail. I am by myself for New Year's Eve while he works the night shift. It is definitaly quiet around here! Enjoy the peace and quiet! Be well and Happy New Year! I've been out watching big fireworks from backyard (show at a park near neighborhood)while hubs is already sawing logs! Wow, wonder what new year's eve will be like in 10 years????? Ewww... lol. HAPPY HAPPY NEW YEAR! Love peanut butter M&Ms, love you. But love YOU more. 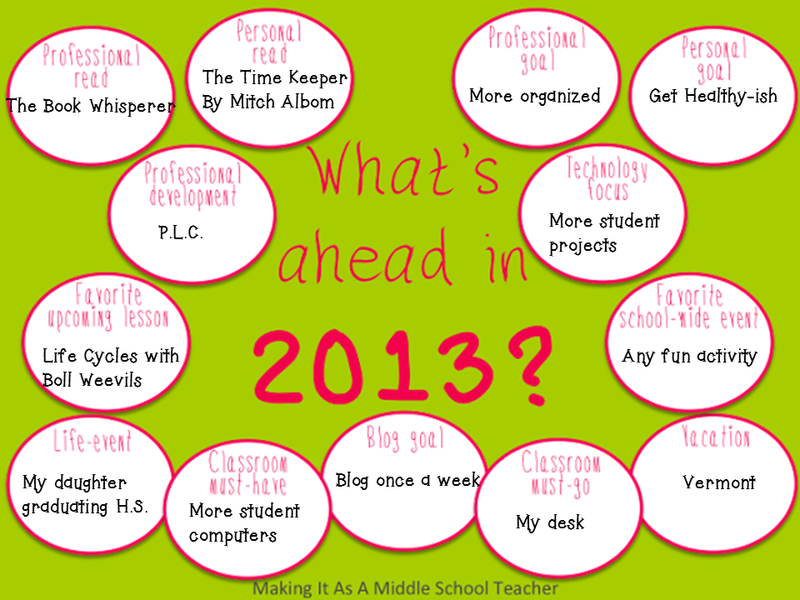 Thanks for making my first year in fourth so much easier by sharing your classroom happenings with us. :) Happy New Year! I wish I were crunching on PB M&Ms :) Like you, I was fortunate to spend a lot of time with family this past week and I wish it could have been more. I hope 2013 is good to you! Love your owl, Lorraine!! And I'm with you on the party animal thing! Relaxing at home tonight! Happy New Year!! Hi Lorraine! Thanks for stopping by to visit....and for the follow! 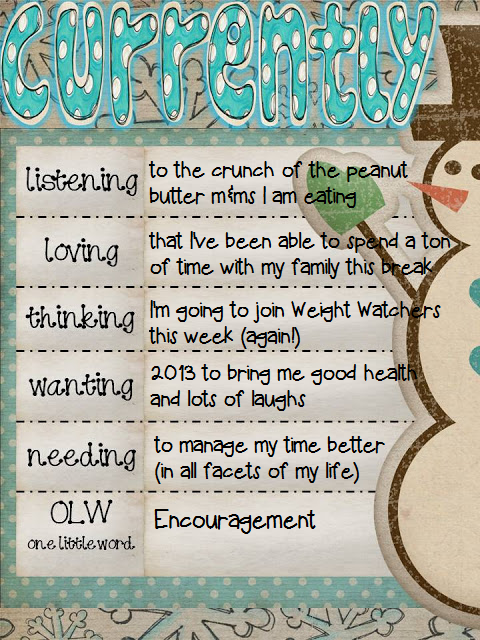 I have been following you for a while...:) I love your OLW....encouragement! What a powerful word...have a blessed and happy 2013! Oh, goodness. If we're talking the little bags of m&ms finishing one is NOTHING. And the bigger bags, well ... been there, done that, too. What kind of tech projects are you thinking of doing? As a teacher librarian I totally <3 anything research/tech related. I hope you have one on your campus that can help you! If not ... find me at my blog. Also the Book Whisperer is pretty awesome. Even if she doesn't mention a school library she has some GREAT ideas on encouraging kids to read. Do you follow her on Twitter? I LOVE peanut M&M's. That's one of my favorite comfort foods when I get stressed. I love the word you chose " encouragement". What a great resolution for 2013! Happy New Year! My youngest graduates from high school this year. Sigh...they grow up so fast! I am now your newest follower!! I just love your froggies, they are so tremendously cute. I created a math workshop rotation board and I just had to use frogs for my theme. I was a party animal like you last night, too. I watched a movie and blogged most of the night. I didn't even make it past 10:30. I love your personal goal of getting healthy-ish.... I think we all want to strive for that one! Hello there! Checking you out now too:) Thanks for the comment. I need all that I can get. You threw a little ENCOURAGEMENT my way by stopping by. Now to the real issue...now I want peanut M&M's. Geesh! I love the 2013 linky you just did. I noticed PLCs bubble. We are doing PLCs for the first time this year at my elementary school. I am interested in how yours work. Following you now! I am so with you on being able to eat a whole bag of M&M's (the big bag). There is a bag of peanut ones calling my name but the stomach bug that hit is good for something:) I love reading your blog!! Happy New Year! I almost wanted to wait for you to get one more follower so that I could be #1000 but I didn't want to miss out on updates! I love your blog! I'm your newest follower from Currently. Please stop by if you are able to.